Introduction: I've always a lot of books, even as a kid. Arranging them is a consistent joy, but how I arranged them has changed over the years. Alphabetical Order - Practicing what I learned in Elem. School. Exact date unknown. Height - When the jagged tops of the previous arrangements started to bother me, & the smooth descending slope of book tops relieved the previous stress. Exact date unknown. Color - Began as an art project my Junior year of college. 2012/2013. Current preference, because it is wildly beautiful (!!!!) & surrounding myself with beauty makes me feel hopeful. To inspire me and get me in a poetry writing mindset. I am focusing on studying YA Adventure, Dystopian, and Fantasy. To learn about and from other writers. For self care and general healing of the mind, spirit, and emotional health. For inspiration from real people. Glass is one of my go-to choices for displays and containers in my studio. First of all, clear glass keeps the color of the objects inside or behind remain visible. It's gorgeous. Secondly, glass helps combine elements of Minimalism with my love for collecting things, or accumulation. Glass is great for adding a sense of airy simplicity to groupings of heavier objects (such as books & art supplies). I've found that Hobby Lobby has the best selection of interesting glass containers if you want to try it out. Floating shelves have been on my wish list for ages, so when we bought a house, can you guess my first purchase? Yup. These are $20 LACK shelves from Ikea- the 74 3/4"x10 1/4" size trimmed to fit our wall. The install was time consuming but oh so worth it. Once they were up, I filled them with colorful treasures that make me feel inspired & hopeful. Some of my favorites include: several glass blown weights & vases I made in the hardest class I ever took, BlueBell Ice Cream containers from the factory in my parents' town, a jar full of linoleum printmaking block shavings, & several artworks from other artists/friends I admire. Also, as you can see, there are tons of books, which I arranged by color. Most of the ones in my studio I bought specifically for the purpose of showcasing their color or to make into art. I'm particularly proud of the cyan stack, as it took the longest to gather! 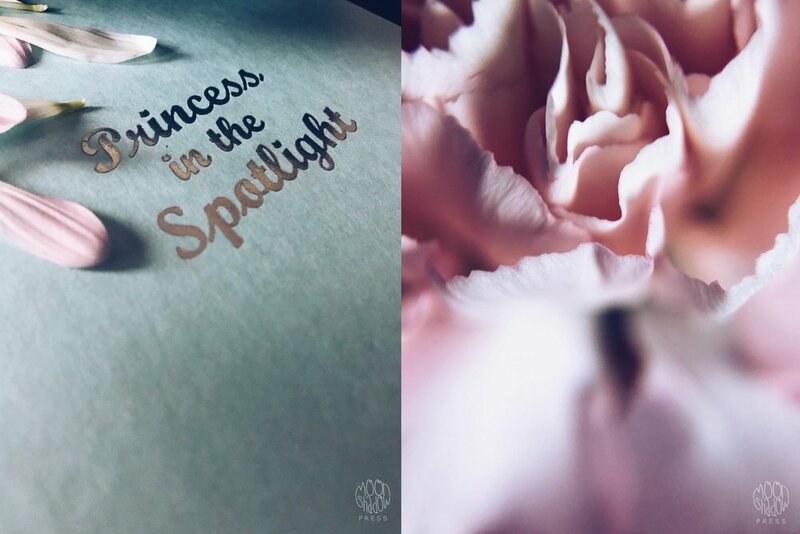 The season of Valentine's is not just for celebrating romantic relationships, but friendships as well. Every year the ladies in my life throw a Galentine's Day party for each other, & it is becoming my favorite part of the holiday season as a whole. This year, I had the honor of hosting, & it was a blast! Everyone brought a box of their favorite tea & we had a "tea exchange," like a cookie exchange at Christmas time, but with tea bags. 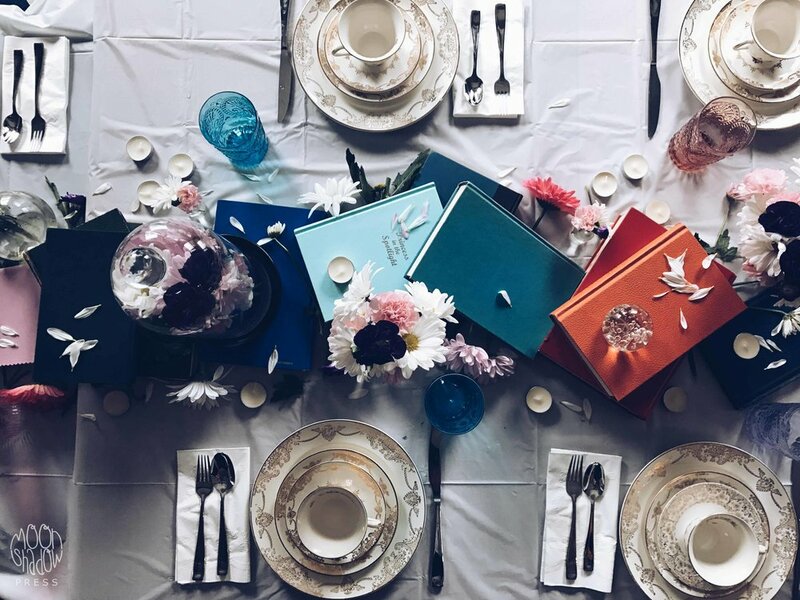 I themed the decor mostly around what I had: books (of course) & a set of family china I inherited as a wedding gift. I did buy flowers, which are expensive this time of year, but it was worth it. Oh, I also bought a white plastic table clothe for a few bucks. Anyway, it all came together in a lovely way, & most importantly, we all had a great time. I went a little crazy with the photography (in the best way), so I'll share more. Happy Valentine's week! I hope you enjoy celebrating all the relationships in your life. As much as I love free candy, there is a lot about Halloween that I'm not into- like blood & guts & body bits. This can make decorating challenging sometimes. However, this year I found some amazing inspiration from the blog, The House That Lars Built. They sided with a more Taxidermy Museum approach, making the bookworm/science geek in me do a happy dance. To add my own spin, I added some Apothecary Spook to the arrangement. 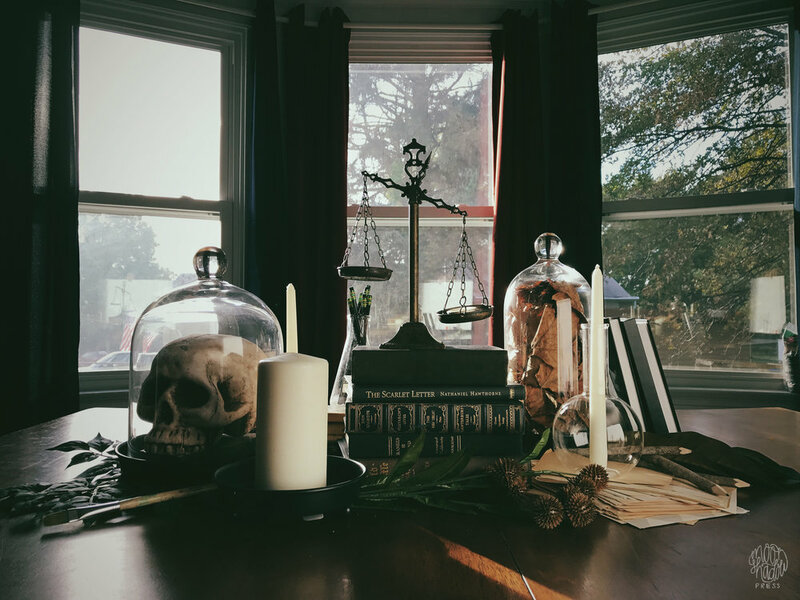 Old books, bell jars, a crow, glass vials, a lone skull, a set of scales, candlesticks, & greenery. Basically, if Shakespeare & Edgar Allen Poe were in charge of Halloween decor, I'm pretty sure it would look like this! PS. I almost didn't include the skull (even in styrofoam they freak me out), but I'm glad I did. PPS. List of places I found almost all of these lovely objects: Michaels, Hobby Lobby, Target, Goodwill, Marshalls, my front yard. Thrift stores are magical places, full of discarded wonders waiting to be rediscovered. One such find is this lovely dream: "Five Thousand Quotations for all occasions," edited by Lewis C. Henry, published in 1945. The cover alone alludes to the treasure trove inside. Since word art is so trendy right now, one of the most difficult parts of hand lettering for me is deciding which words to use. Some quotes, such as J.R.R Tolkien's, "All who wander are not lost," are all over the place and great sellers. I absolutely love that phrase, but I feel like it's popularity has made it a trite subject matter to use. As a result, the question I always find myself asking is how to balance originality and just the right amount of trendiness to sell work. It's a big issue that I am constantly working through and testing. With that in mind, imagine my joy in finding this book of old, awesome, weird quotes from a variety of well known and obscure sources! It is the perfect collection to use along side of my own words, if only for inspiration's sake. I'm not sure where it will go, but I can't wait to share some of the golden nuggets of wisdom living inside these pages! 1. The ever expanding collection of tangled thoughts, experiences, & emotions that hover over our heads.